Will my child ever really understand the gospel message? Can they ever grasp the love of God? Is it possible that they could ever know Jesus? At some point during their pregnancy, and perhaps even their child’s infancy, these questions may not have frightened them so much. But then the day came when they realized that their child wouldn’t be learning the way others would learn. It doesn’t take long for Christian families to come to the place where they want to access their child’s capacity to learn, know and understand the greatest story ever told – the Gospel message. 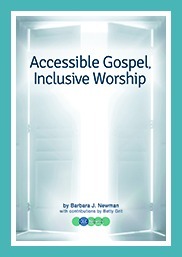 In her new book, Accessible Gospel, Inclusive Worship, a new resource from Barbara J. Newman and CLC Network answers this question unequivocally with a resounding “Yes!” While her credentials give her a voice to speak to any number of topics from specific disability interventions (such as Autism or Down Syndrome) to classroom strategies for general behavior management, she says this topic is “the reason for every other topic on my speaking list.” The underlying assumption of this book is that everything is about making it possible for people to connect with Christ – regardless of their ability or disability. Newman walks readers step-by-step through a process that begins with finding common ground with every learner. From this point, she explains the importance of identifying how a person takes in information in order to most clearly communicate the gospel message to them personally. Filled with examples of real life stories from Newman’s ministry experiences, the pages come to life as the message the gospel is told over and over again in many different ways. Perhaps one of the greatest contributions Accessible Gospel, Inclusive Worship makes is its re-framing of our concept of worship as a whole. Newman makes the point that creating an accessible worship environment is about so much more than wheelchair ramps and bathrooms that are handicap accessible. Newman writes Most of our worship settings can be described as a conversation. While some of them are corporate and others are individual, we enter into a place where we speak to God and allow God to speak to our lives. For some individuals with disabilities, the tools we use as part of that conversation might be a bit different from some of the traditional tools. For example, if we use only spoken words set to music for the part of the conversation that says “I love you, God,” then we have left someone out who has no spoken words. How can we make that part of our conversation with God inclusive each worshiper? Using the concept of Vertical Habits, developed by the Calvin Institute of Christian Worship, Newman goes on to examine worship as expressions by which we tell God “I love you,” “I’m sorry,” and “I’m listening,” just to name a few. 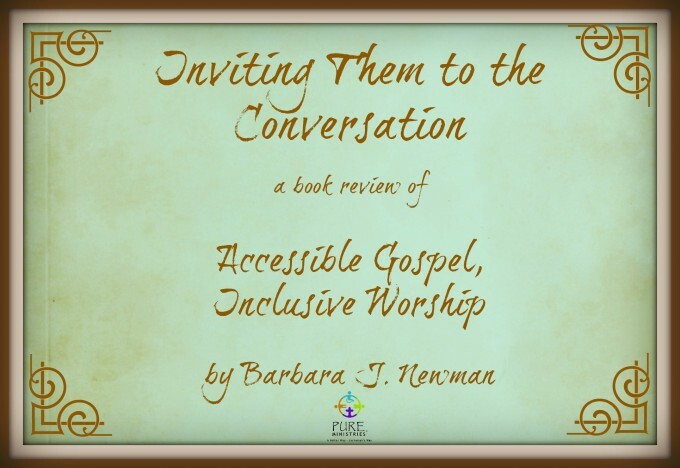 By reframing worship in this light, Newman is able to invite people of all abilities into a conversation with the God who made them in his image. Inclusive worship affects so much more than just the person with different abilities. This person is usually attached to a family or caregivers who are also thirsty for an opportunity to worship. Accessible Gospel, Inclusive Worship gives churches the tools to invite everyone to worship. Hear me interview Barbara J. Newman on Shaping Special Hearts here. welcome everyone into the house of God. Barbara Newman given us the tools to invite everyone to worship. A post a wrote a few years ago about Noah’s view on a holiday classic…enjoy! I’ve been doing “research” for a talk I’m giving next month. It’s a holiday gathering so the theme is preset, and I’ve got a pretty good idea where I’m going with it but I still like to research thoroughly. In doing my research, Noah and I have been watching some of the classic holiday movies. Watching a movie with Noah can be a strenuous experience. You have to be prepared for a lot of stopping and rewinding so that he can memorize a line in order to quote it perfectly 2 months later. As far as Noah is concerned, on the 8th day God made TiVo. I replied, “What do you like about Hermie so much?” Noah answered, “Well, we both have kind of yellow hair and also, Hermie is happy and sad at the same time.” When I asked how it is possible to be happy and sad at the same time, Noah said, “Well, you see Mom, he is a misfit. He is happy because he wants to be a dentist, but sad because no one understands him. So he is happy and sad at the same time.” Not passing up on a “Noah moment” I asked, “Are you happy and sad at the same time?” Noah answered, “Yes I am, it just depends on how I open my eyes.” While I pondered the weirdness of that statement, he began the video again. Soon, Rudolph and Hermie have teamed up and run away in an effort to “be independent together”. They jump on an iceberg and head out for points unknown and arrive at The Island of Misfit Toys. At this point, Noah stops the video again and says, “Mom pay attention, this is the important part.” (At this point, I also grabbed my laptop.) They are greeted first by the sentry who appears to be a Jack-in-the-Box, but informs them that he is actually a Charlie-in-the-Box. This is why he is a misfit – because, “…no child wants to play with a Charlie-in-the-Box.” Soon many other toys that have peculiar traits greet them. Now its quite possible that Noah was just discussing the finer points of 1964 made for tv animation, but somehow I don’t think so. You see, it’s a story of Hope. Advent is a season of preparation for the coming of Christ and a part of that larger story is Hope. In fact, it is woven all the way through scripture. In this story, the toys on the island have cause for Hope because they have a King that sought them out when no one else wanted them. And more than that, he provides for them a safe place of respite until they are wanted again. Please don’t miss the point – the King searched for them. This is the best part of the Hope: because the King had ‘open eyes’ no toy – no matter how big a misfit – went unredeemed. All toys are of value to the King, no matter how broken. I praise God for the Hope I can find because I have a King that came looking for me. Unwilling to allow me to remain a misplaced, misfit – he is redeeming the parts of me that he can work with and discarding the parts that he can’t. I’ve got Hope. I thank God for the Hope of the season that comes in the form of a source on which to fix my eyes. I’m a misfit, but he isn’t done with me yet. I am actually beginning to suspect that we misfits might be his favorites. Maybe it’s easier to show us how to direct our gaze. After all, it’s all in how we choose to open or focus our eyes. I’ve got Hope. I thank God for embracing the misfits and then using us in a wonderful way to show his glory. We have a marvelous Hope because we open our eyes to the eternal and not only the temporal. We’ve got Hope. 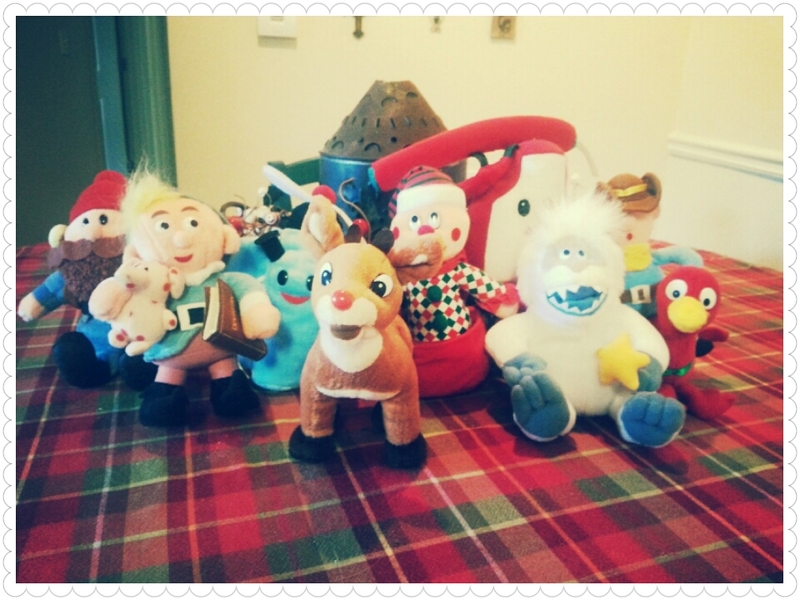 To all the misfit toys out there, Noah says there is Hope for us yet…it just depends on how we open our eyes. The invitation to attend came quite unexpectedly. “Oh, you don’t want to miss this!” they exclaimed. Unable to resist, I arranged to make my way to First Baptist Church of Tucker for their annual “Special Needs Ministry Sunday.” Each year on this designated Sunday, the ministry devoted to people with differing abilities leads the congregation in songs of worship, offering and prayer. I have been to all kinds of worship services. From High-Church liturgy to church camp vespers, I have had the opportunity to worship in many settings representative of many styles of sermon and song. But I have never encountered any worship setting quite as rapturous as what I would participate in on that day. The excitement was palpable upon entering the beautiful sanctuary of this church that was celebrating its 120th year. When the ushers who greeted me at the door learned that I had come especially to attend this service because of its leadership, I was personally escorted to a pew of honor where I could have an unobstructed view. The choir loft was already filled with PURE people and their caregivers, who were eagerly awaiting the start of the day’s service. After a brief welcome and responsive reading, ending with the instruction from Psalm 133:1, we sang a few songs of praise in rapid succession. Appropriately, we confirmed “How Good and Pleasant” it is when God’s people can dwell together in unity. As if to answer how this can be among a people so diverse, the opening strains of “Jesus Messiah” began to play. I gazed from the screen where the words were being projected to see many members of this PURE choir using American Sign Language to tell the story in song of a messiah who was the “…name above all names…Lord of all.” By the time we reached the bridge, each PURE person was intoning with all his or her might “…all our hope in you, all our hope is in you. All the glory to you God, the Light of the World!” Tears began to course down my cheeks that would not stop until the Benediction. Read more about this PURE worship experience here. The Holy Bible: Today’s New International Version. (Grand Rapids, MI: Zondervan, 2005), Ps 133:1. Shaping Special Hearts: Family in Crisis 11/12 by CMConnect | Religion Podcasts. How can we pratically minister to families of special needs children in the midst of crisis? What kinds of emotional and physical supports can we offer families in times of hospitalization, illness and in the face of everyday challenges? Join Vangie Rodenbeck and her special guests Adeye Salem & Tina Kacirek. Both bloggers and moms of special needs children, Tina and Adeye have layers of rich experience that will empower you in your ministry to families in transition and crisis. I wanted to highlight another piece that I wrote for PURE Ministries about how respite ministry looks a lot like “kingdom come.” I hope you enjoy it. After 3-hour night of respite ministry, I realize I hadn’t really known what to expect. That night, I had seen amazing relationships being forged between typical people and those we cherish as PURE. I had personally witnessed a schedule and format that was complete genius as it allowed everyone to focus on their strengths and abilities rather than their deficits. Meeting and speaking with servants of this incredible ministry had left my fingers itching to write. But we were instructed to assemble in a large group meeting room for some kind of benedictory activity, so I slowly navigated toward a seat in the back of the room. The last thing I expected, knowing how much energy this night had cost me personally, was a worship service. I don’t think I had ever considered what it would be like to worship with so many PURE people. Because my son’s primary anxiety trigger is auditory input, worship is very difficult for us. Noah simply cannot handle all the sensory information in the form of music, voices, clapping hands and moving bodies. His typical posture is to sit, shoulders hunched-over in a protective posture, with his hands over his ears. This has perhaps been one of my greatest sorrows as the mother of my PURE child. Worship through music has been a life-long love of mine. I learned not only to sing harmony in church at my grandmother’s side, but also to sight-read music. As a matter of fact, the first book I probably every “read” was a hymnal. As I grew I joined choirs and, eventually, became a children’s choir director and worship leader. Not being able to share my love of worship with Noah has been difficult. I suppose it is natural to want to take that which brings me so close to God and impart it to my son. But for Noah, it is anything but “natural.” It is painful. As we took our seats in the meeting room, I double-checked Noah’s noise reducing headphones to insure that they would help him endure a time of worship. I was comforted to see other PURE people entering the room taking similar precautions. So I settled us in as Miss Lorie began a few preliminary announcements. Then the completely unexpected happened. After calling into the audience for the worship leader, she handed the microphone over to a young PURE man who was about 14 years of age. It was clear that he had done this before, for everyone began clapping in preparation for a song that I would never forget. Noah and I went out to eat this week. It was really just something to break the monotony. Actually, we were a little down and I thought it might cheer us up. He loves to eat in restaurants, especially new ones. 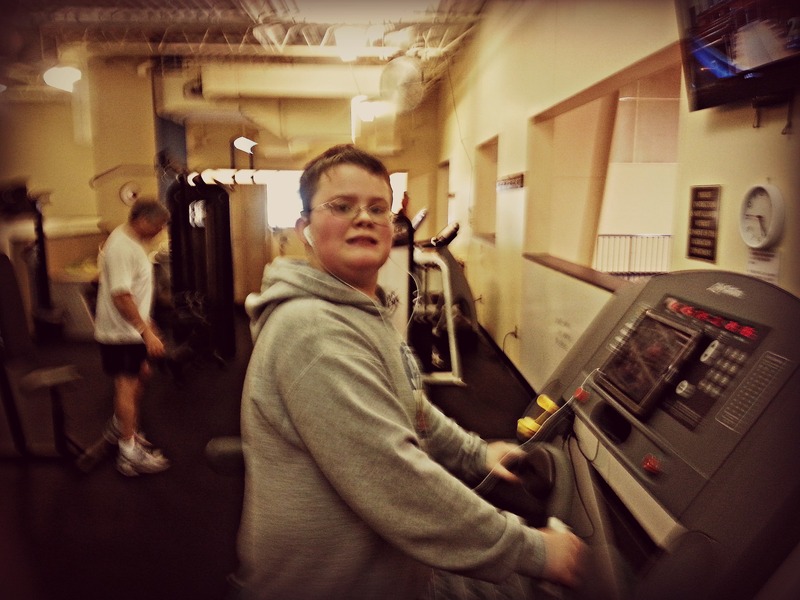 Yeah, I’ve got one of the only autistic people in the world who likes to travel to new places and do new things. So I figured it would be just the pick-me-up we needed to push through our week. He loves Chinese, mainly chicken wings and rice, so we tried a new place. It was a little early for the dinner crowd, so we had most of the dining room to ourselves at first. But just after we ordered our meal, a well-dressed couple was escorted to the table beside ours. Just as the lady sat down, Noah flapped. Then I heard it – a gasp-grunt. Out of the corner of my eye I saw her flag down the hostess. She said, purposefully loud enough for me to hear in an otherwise quiet dining room, “We can’t sit here. We’ll have to be moved.” My head spun around on my neck because I thought there must be a leak in the ceiling over her table or rat droppings or something to disturb her so. But when I turned around, and met her sneer, I realized that her problem was us. Noah continued to flap (this whole exchange lasted maybe 45 seconds) so he missed her subtle eye roll in my direction. This has happened before. But it was a long time ago. I had forgotten the painful sting this brand of rejection leaves. Honestly, I could barely breathe. The waitress, who had seen the whole thing unfold, was quietly sympathetic. She spoke kinder than was necessary to Noah. He, of course, returned her kindness with over-the-top manners he must’ve picked up from watching re-runs of Father Knows Best. He said things like, “thank you for being so sweet to us” and “I hope you aren’t tired after work tonight” and “aren’t you kind.” The more he tried to show thanks for simple kindness, the more sick to my stomach I became. When I knew she would watch him while I went to the restroom, I quietly excused myself. Once safely in a stall, I cried my eyes out. After washing my face in frigid water to get the swelling down, I returned to the table. Just when I thought the worst was over, I felt someone else staring. From over the top of the partition, I saw the hostess catching a peek. As if on cue, Noah began flapping again. I sighed and put my head in my hands. When I looked up, I saw the hostess escorting another couple to the other side of the restaurant. It was now the dinner rush. I watched family after family come in only to be seated as far as possible from Noah and I. We had been quarantined. At some point Noah noticed because he glanced around and said with a grin, “Well, I guess it’s just us huh? Kind of romantic.” I smiled a watery smile and choked down a bite of dinner. Its funny how even the moistest of food can turn to sawdust in your mouth. But then Noah began to tune into the worst thing he possibly could have – me. 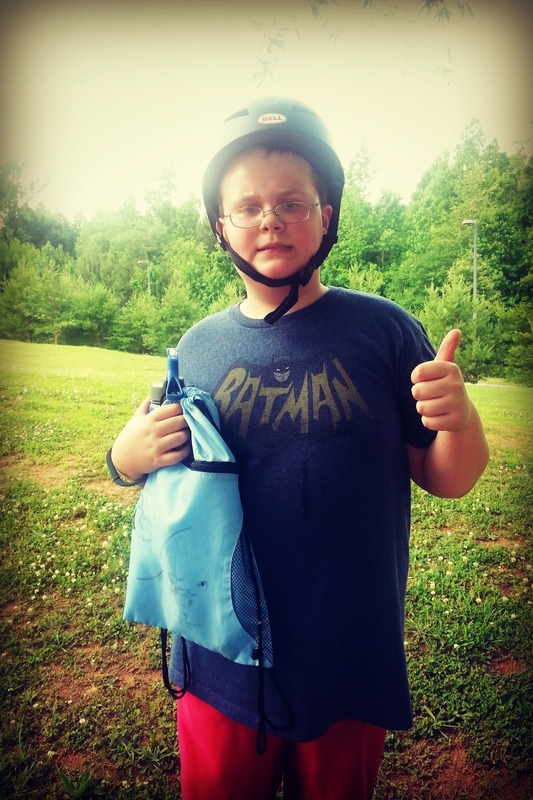 He read my distress and responded with, “Mom, I love you.” I answered that I loved him too. More than anything. No less than ten times during our meal, Noah told me that he loved me – more than anything. At this point, you may be wondering why I collapsed instead of responding in my usual snarky flesh. All I can say is: Sometimes, even the feistiest of us loose our snark under the strain. It did occur to me later that I could’ve hollered across the room to the first woman, “Hey lady! Did that lump you came in here with tell you he loved you during dinner? Because this kid that wasn’t good enough for you told me about ten times!” I thought of TONS of horrible things I could have said. Luckily, I was just too beaten down to come up with them at the time. But then I had a thought that I’ve been prompted to consider through some reading and preaching I’ve been listening to. What would Jesus have done? Not WWJD – “What would Jesus Do?” But, what would Jesus have done if he were me living my life in that very moment. The process of trying to picture Jesus as the parent of an autistic child proved too much for me that night. But I did wonder this: What would Jesus have done if he had just happened into that restaurant that very night and seen everything unfold? Believe me, I was praying desperately to feel him at that table. The rejection was so, well, violent. Normally we think of violence as a physical act of aggression. But I think I experienced a subtler and deadly form of violence, and perhaps one more common than even physical aggression. We were simply rejected precisely for who we are. There was no second chance at redemption. We weren’t offered an opportunity to explain our exceptionality. We were just cut off and discarded as broken beyond repair. We were an embarrassment. Our awkwardness and inelegance brought shame and isolation. We were invisible. We were each story of every marginalized creature Jesus came upon during his ministry. We were ostracized and in need of inclusion. We were diseased and in need of healing. We were unclean and in need of justification and cleansing in order to be made whole again. And we aren’t the only ones. As alienated as I felt that night, and for several days afterward, Noah and I are not alone. More and more frequently, I am becoming alert to hurting and broken people. Often we are tempted to think that people are experiencing a reality they had complete responsibility for creating. Often times, as with us, that is not simply the case. Just as even the most sinister of objectives have unpredictable conclusions, the most innocent of best intentions can be catastrophic. There is not always a simple answer for suffering. And even if it appears there is a simple answer, the root causes for some issues are too complex to explain away in an attempt to systemize pain and suffering. I’ve noticed when we work so very hard to explain affliction and distress that we are doing so in an effort to exclude ourselves from a possibility of such tortures in our own experience. In other words, if I can explain how that person got into his or her situation I can keep myself from suffering similarly. But we are missing the point. I don’t think we need to explain it away. I don’t think we are ever called to figure it out. As a matter of fact, I believe we’ve been called to act in light of the fact that we cannot comprehend it. I don’t think love takes the time to evaluate suffering that way. Love simply acts in the face of the uncertainty. Love moves in the midst of the mess. Christ’s kingdom on earth wasn’t meant to assess every risk and liability associated with agape love. If that were the case, no one would take a risk on Noah and I because we don’t look that good on paper. No, kingdom doesn’t work that way. It isn’t logical. Very often it is counter-intuitive. It runs toward instead of away. It embraces instead of alienating. It takes on the suffering of the world. Where was Jesus in the Chinese restaurant? He was a young waitress who appeared to be about 5 months pregnant and was waiting tables. Her eyes were tired and she looked dead on her feet. I’m sure she didn’t understand the complexity of Noah’s neuro-diversity. She probably didn’t have a certification in Autism Spectrum Disorders. In all honesty, I think she was probably a college drop out. But she didn’t seem to feel the need to place us on the continuum of acceptable risk. Instead, she was kind. And it didn’t cost her a thing. I ended up bringing most of my dinner home. I even packed up the fortune cookies because I just couldn’t stay in that room one more second. A few days later Noah pulled his off the counter and opened it. It read: “You will influence many people with your words and travel far.” Ironic, but no less so than mine which read: “You are cherished.” Neither fortune seemed appropriate that night because I forgot that kingdom is often found in the small, least likely of places – like the face of a waitress who wasn’t too tired to be kind to a child who appeared to be retarded on the surface but could meet kindness with kindness. And in the words of that same child as he comforted his mother with the words: Mom, I love you more than anything. Maybe our fortunes weren’t so wrong after all.